In an article written in Interfax on June 26, managing director of Cefeidas Group, Juan Cruz Díaz was quoted on the recent firing of former Energy Minister, Juan José Aranguren. 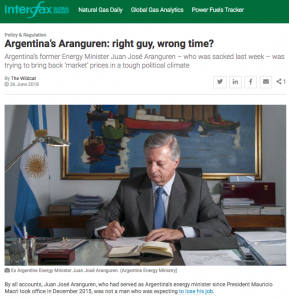 Juan Cruz Díaz of the Buenos Aires-based political consultancy Cefeidas said that Aranguren could have been a “sacrifice […] to stabilise the political effects of the economic [and] financial turbulence that we are suffering”. “Aranguren’s position was being eroded by his style, the tariffs [issue and] his personal issues,” said Diaz. He also noted that Elisa Carrió, a prominent member of Macri’s coalition, is enjoying greater influence in the Casa Rosada. It was no secret that she held Javier Iguacel, who was named as Aranguren’s replacement last week, in high regard.